In last week's Blitz of the Week #3 post the focus was on Nick Saban's packaged zone pressure concept Field Alaska/Crash Zone which can be seen here. Another packaged zone blitz that is featured in the 2001 LSU playbook is Field Alaska/Atlanta Zone. The first half of the blitz is Alaska. Alaska is the Mike and Will on an X blitz in the field A & B gaps. 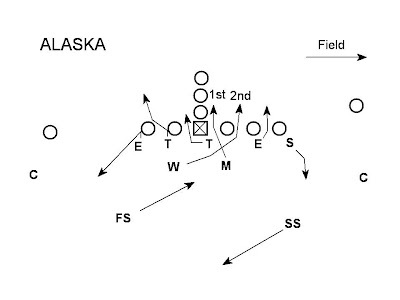 If the 3 man surface is to the field the blitz is Field Alaska Zone. If the 2 man surface is to the field the blitz is Field Atlanta Zone. Atlanta is the same blitz as Alaska vs. runs to the field and passes. The difference between the two only occurs on run flow to the boundary where the Will LB will read out of the blitz and play a normal shuffle scrape technique. On the read out in the Atlanta blitz diagramed above the 3RH dropper (SS) will be able to handle any cutback to the field B gap that is being vacated by the read out Will linebacker. Having the read out allows the defense to improve their numbers against TE run in the zone blitz package. With the TE into the boundary(Atlanta) the defense gets the read out Will LB back involved and with the TE aligned to the field(Alaska) the defense gets a blitz to the TE.